On May 17, 2011 at 5:00 AM the SWAT Team of the Los Angeles Sheriff’s Department and members of the FBI raided the home of Carlos Montes, a long time Chicano activist and active member of the Committee to Stop FBI Repression. The SWAT Team smashed the front door and rushed in with automatic weapons as Carlos slept. The team of Sheriffs and FBI proceeded to ransack his house, taking his computer, cell phones and hundreds of documents, photos, diskettes and mementos of his current political activities in the pro-immigrant rights and Chicano civil rights movement. Also taken were hundreds of historical documents related to Carlos Montes’ involvement in the Chicano movement for the past 44 years. Carlos was arrested on one charge dealing with a firearm code and released on bail the following morning. His first court appearance is set for June 16, 2011. This attack on Carlos Montes is part of the campaign of FBI harassment taking place against the 23 peace and justice activists which has until now been centered in the Midwest. Carlos Montes’ name was listed on the subpoena left in the office of the Twin Cities Anti-War Committee last September 24. 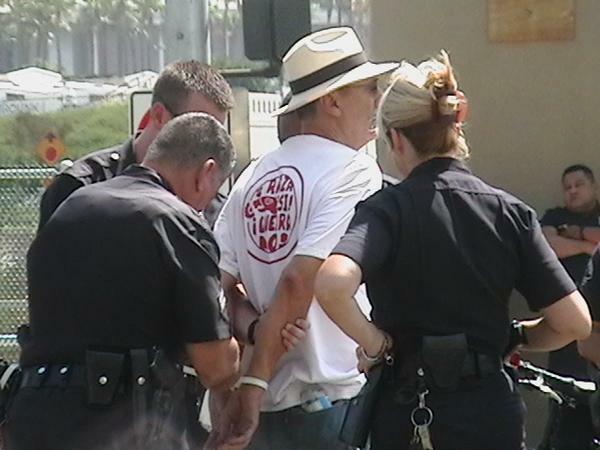 When Carlos Montes was placed in the LA County Sheriff's car, an FBI agent approached and asked him questions about the Freedom Road Socialist Organization. Carlos Montes has done nothing wrong. This is an attack on him and an attack on the Chicano movement for equality. Carlos has been involved and a committed leader in the immigrant rights, anti war, solidarity, and quality education movements his whole adult life. We demand all charges be dropped against Carlos Montes. We call for the immediate return of all his property. Please call and write US Attorney General Eric Holder (202) 353-1555 and demand Hands Off Carlos Montes and other activists. Join the LA Committee Against FBI Repression on May 24, 2011, at 7 PM to hear first hand about this attack and discuss the FBI repression targeting political activists and movements. The program will take place at F Square Printing, 519 South Spring Street, Los Angeles, CA 90013.